Tempest Devyne is having a Bowie Sewalong and her hosting skills are impressive. She’s got everything from fact to music to a paperdoll! For the month of March, she’s inspiring us to sew Bowie-esque…well, just about anything. Anything that screams Bowie to you, or in the cake of my t-shirt, it probably just whispers. 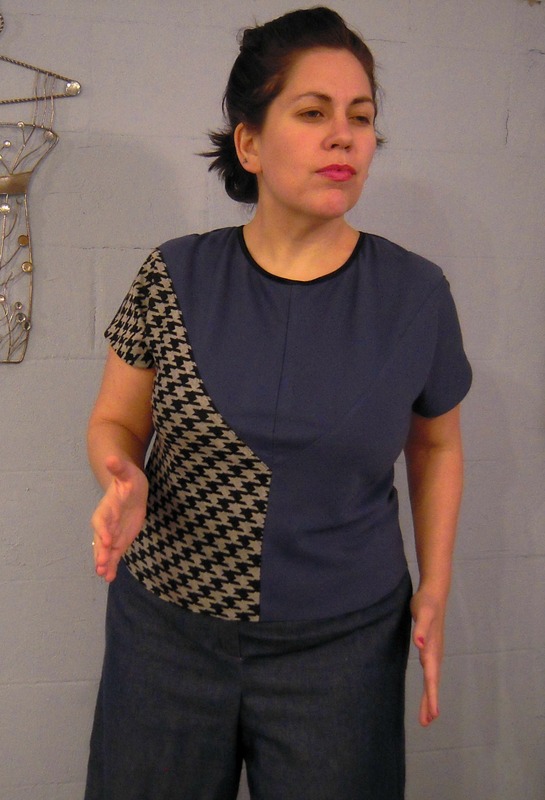 I started with StephC’s Blank Canvas Tee pattern, which I’ve used before, and an 80s pattern from within the cracks of my pattern stash. It must have been all that Bowie I’ve been taking in cos I wanted an 80s t-shirt. 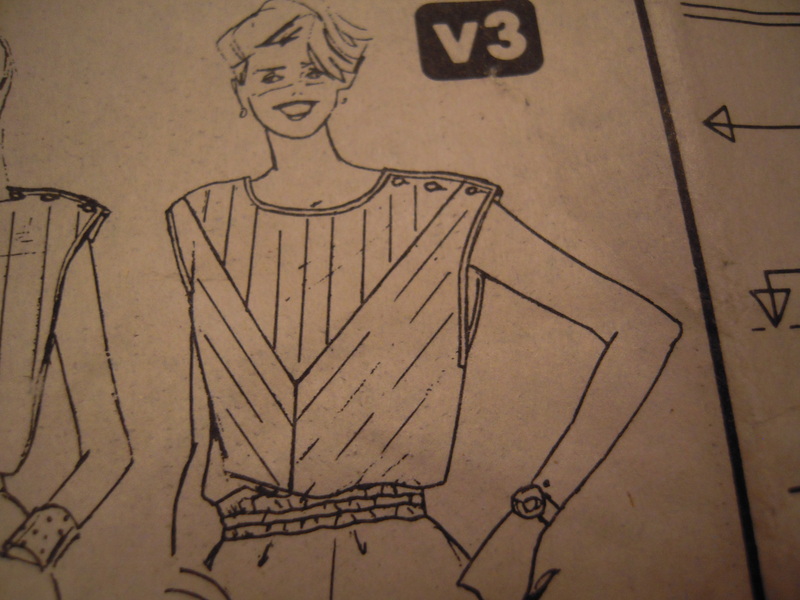 I wasn’t about to cut into my vintage 80s pattern …hahahaha…no, I didn’t want to bother with fitting so I took the BCT and make a fresh copy to chop up into this divine memory piece. I ignored everything but the V and I even made it easier on myself and gave the whole front and center seam, even up to the neckline. It was a fun exercise. It’s a totally tame Bowie tee but hey, I’m warming up. I’m pulling the t-shirt down cos there’s this stupid bubble in the center seam. The one seam I didn’t apply steam-a-seam to and of course, it bubbles. I’m a dork. That’s all that needs to be said. 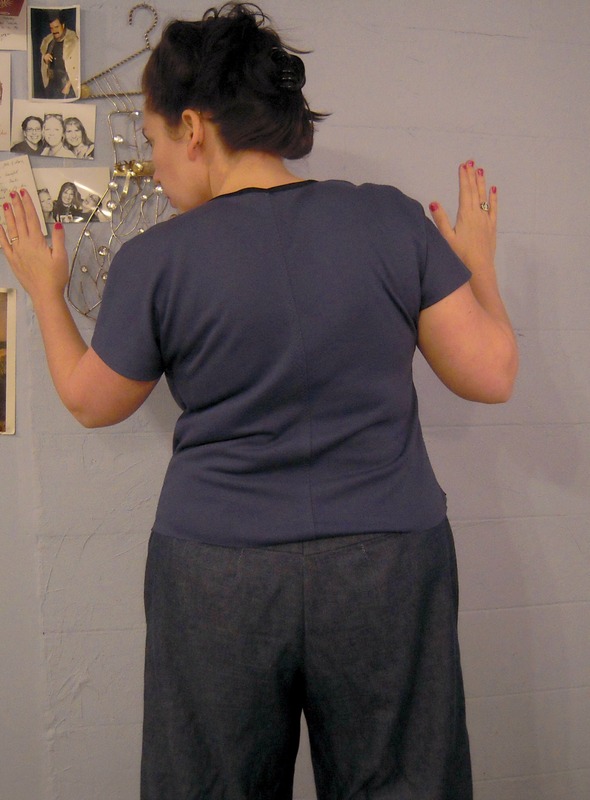 I know it’s not fitted as much as it could be and the back needs a little adjusting but this was a quick project and I honestly forgot to make the back fix from the last time I used this pattern. Enough of me defending this t-shirt. Anyone else have Bowie memories? Favorite song? I love it! 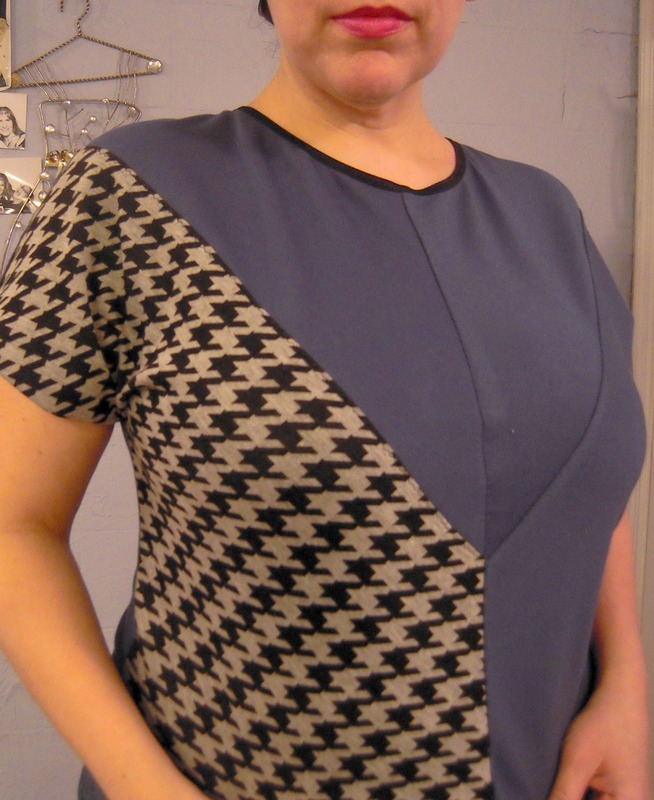 The houndstooth placement is great- it screams 80’s wonderfulness- the kind that doesnt go out of style! Thanks! I’m feeling sooo 80s today. I think I might peg my pants now, too, chew gum loudly and tell everyone how unfair everything is…ah, my youth. yeah, sometimes I just want something to be loose and for a t-shirt this is a way better fit than the t-shirts I buy, tho they’re mostly really tight so I don’t get all the bunching and stuff. still fun. I love Bowie, going to have to look into this sewalong! And, your top is great! Really like how you opted to only put houndstooth on one side. But, what is causing that bubbleness on the front? Oh, please do join up. It’s pretty relaxed. Make at least one thing and it’s your choice. It’ll be fun. I really haven’t thought too much about the bubblesness on the front. If you have any thoughts, I’m all ears. Not sure, was hoping you’d know about the bubble cause so that I could avoid it in my next make, lol. I have signed up for the Bowie Sew-Along!! How cold I not??? I’m so glad you joined the Bowie sewalong. Yay! Yeah, how could we not?! I’ll play with the bubble and see what i come up with. Might just need a topstiching. I topstitched all the other seams and they turned out really smooth. Favorite Bowie song: Modern Love. He can do no wrong in my book, though.